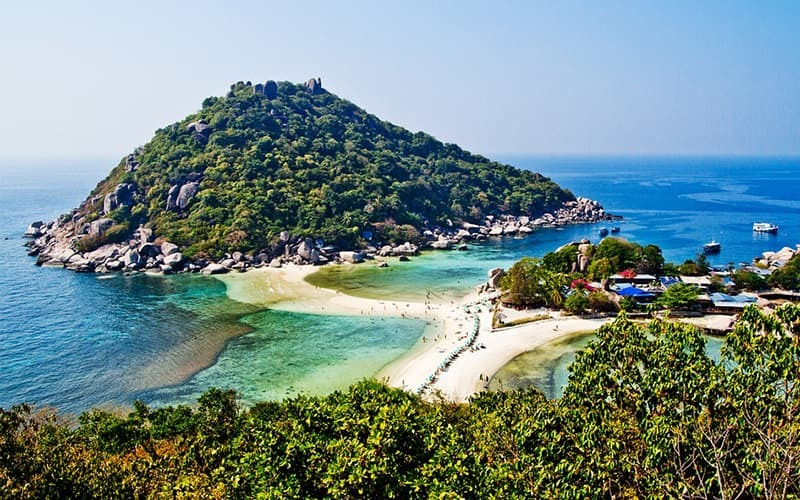 Koh Tao is a pleasant place for divers and not too far from this island, there is another island called Koh Nang which is often seen in pictures. It is also one of the ideal places for tourists who are fond of islands and wish to take a break from their lives. The island is known for its crystal-clear water, its diverse marine life, the hike up a point with a beautiful view and activities like snorkeling and zip lining. Follow the post to and get the answers to each possible question that might help you during the journey to Koh Nang Yuan. The distance between Koh Tao to Koh Nang Yuan is only about 15-20 min from long tail boats. If you are not planning to stay overnight, it is ideal to book a boat for going back as well to avoid walking around to find a boat. The trips at the Koh Sumai are rather so it's better to travel through Koh Tao if you wish to explore Koh Nang Yuan. You can get a tour operator for snorkeling for roughly around 2000-2500 BHT per person which will include boat transfer, equipment for snorkeling, lunch and the entrance fees to the island. If you feel more adventurous, you can take 15-20 minutes to hike up and see the viewpoint where the sight is rather breathtaking. You can see three islands connected by a large sandbar. The view is more amazing during sunset. You can wear shoes that are comfortable like flip flops to walk up the short uphill although there are some places where you will need to squeeze or climb your way up. Make sure to have some cash with you, as there will be entrance fees which can be redeemed for drinks at the resort. Since it's a well-known place, you should be expecting a lot of people coming to the beach, you can either go to the beach offseason or just try to enjoy with the crowd. Aside from the crowd, the beach is awesome with white sand and clear water and you can take a sunbath, relax and enjoy your trip. The snorkeling and diving experience at Koh Nang Yuan is quite fun and different from a lot of other islands. There are wonderfully soft and hard corals close to the beaches. Twin Peak and Japanese gardens are two of the nearby diving sites where the water is shallow enough for snorkelers to enjoy without the risk of drowning. Apart from these, White Rock and Green rock are also great places for diving. The marine life here is very beautiful and includes various different kinds of species. If you are interested in snorkeling, this is a wonderful opportunity to witness some diverse marine life and colorful corals. The resort itself also consist of a dive off the shop. It consists of 3 tiny islands that are joined by a sandbar. This image is seen on the postcards of Thailand Kingdom. It is also the first place to have the island to island ziplining. You can even do snorkeling here. Also, if you are unsure about ziplining, the resort staff would happily help you out with the whole process and then you can decide if you want to do this activity or not. We have specially-designed tour packages, offering you a chance to relax on thailand beaches. These can be tailored to include Bangkok, Phuket and Chiang Mai etc. Our travel advisors can also help you tailor-make a tour according to your requirements. See those itnerary for inspiration. The restaurant in the resort is the only place to buy food and due to this, the prices here are considerably high. The cost is around 3-4 times higher than that of Ko Tao. The staff makes sure you know that they are doing you a huge favor by serving you food on this island. The menu offers Thai and Western dishes. The specialty, however, is BBQ fish and therefore it is more expensive than other food items. If you have enough budget you can have your lunch in the resort and carry snacks as well. If you don't have that kind of money, you can take a return boat taxi to ko Tao and eat lunch there. The rooms with low costs are usually booked in advance especially in the peak season, therefore, it's better to fill your spot earlier. While calculating the total cost, remember to factor in the cost of food and drinks which is 4x vs. Ko Tao and > 10x for equivalent volume water vs. Ko Tao respectively. There is no telephone service, so you must go downstairs to the reception if you wish to contact someone. Also, since there is no telephone, there is no room service. All rooms have TV however not of all of them can be viewed. Although you can get a DVD player and rent a movie which can be obtained from reception for free. The nightlife on Koh Nang Yuan is close to none, therefore, remember not to make any night plans since you can't travel during night times. Several rooms may require narrow stairs or hiking up the mountain. The place is pro-environment and therefore doesn't allow any plastic use so if you bring any plastic water bottles, it will get confiscated and you will have to buy food from the restaurant. If you have any other water container (non-plastic) you can bring that instead to save money from buying water.